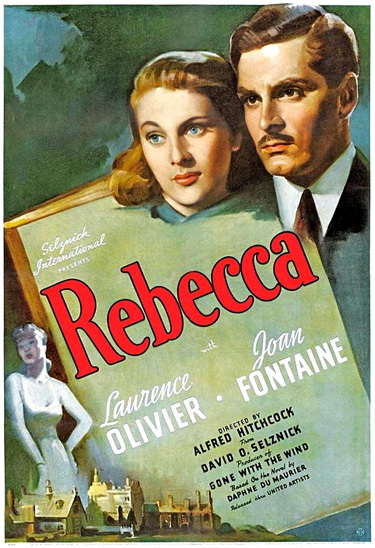 Rebecca (1940) is the classic Hitchcock gothic thriller and a compelling mystery (and haunting ghost story) about a tortured romance. An expensively-produced film by David O. Selznick (following his recent success with Gone With The Wind (1939)), it was Hitchcock's first American/Hollywood film, although it retained distinctly British characteristics from his earlier murder mysteries. "What was the secret of Manderley?" "Could the secret of Manderley destroy their love?" The film creates a brooding atmosphere surrounding the tragic courtship, marriage and relationship of a naive, plain and innocent young woman (Joan Fontaine) to a brooding and overburdened widower - an aristocratic, moody patriarch (Laurence Olivier) who lives in an estate named Manderley. [Note: The woman was unnamed as in the novel, but in early drafts of the original script, the heroine's name was Daphne - after Daphne du Maurier.] The pathetic, bewildered and shy bride experiences fear, pain and guilt when psychologically dominated by the 'presence' (and memories) of the deceased first wife (named Rebecca but never seen on screen), and when she is tormented by Rebecca's blindly adoring, sinister and loyal housekeeper's (Judith Anderson) recollections of the dead woman. Only by film's end, with the flaming destruction of the estate, do the real character and secrets of Rebecca's death become clear. Many well-known actresses tested for the part of the young woman - Loretta Young, Margaret Sullavan, Anne Baxter and Vivien Leigh (her role in Gone With the Wind (1939) made her participation impossible), and Ronald Colman was also considered for the male lead role. This black and white film received eleven Academy Award nominations - and won for the nominated director his first and only Best Picture Oscar, beating out strong competition in 1940 from The Grapes of Wrath, The Great Dictator, The Philadelphia Story, and Hitchcock's own Foreign Correspondent. With his Best Picture win, Selznick became the first producer to win consecutive Best Picture Oscars. The film also won an Academy Award for Cinematography (George Barnes), and was nominated in nine other categories, including Best Actor (Olivier), Best Actress (Fontaine), Best Supporting Actress (Judith Anderson with her sole career nomination), Best Director (Hitchcock's first nomination in this category), Best Screenplay, Best B/W Interior Decoration, Best Original Score (Franz Waxman), Best Film Editing, and Best Special Effects. In the picture's prologue during the narration, the camera pauses at the tall iron gates of Manderley, an English country mansion, and then moves through them. The camera then twists up the drive that has become overgrown with underbrush and foliage. At the end of the drive, the camera tracks to the right through Manderley. The mansion's gutted, forbidding, burned-out ruins are seen silhouetted in a shrouded mist, viewed in shadow and moonlight. Man: What the devil are you shouting about? Who are you? What are you staring at? Man: Oh, you did, did you? Well, what are you doing here? Woman: I was only walking. Man: Well, get on with your walking and don't hang about here screaming. The plain, shy, naive, and innocent young woman (unnamed in the film until she is married and adopts her husband's name) is on an off-season trip to Southern France (Monte Carlo - the French Riviera) as a traveling "paid companion" with her wealthy dowager Mrs. Edythe Van Hopper (Florence Bates), a vulgar and unpleasant American employer. In the lobby of the vacation-resort hotel, Mrs. Van Hopper is upset that there is not a single "well-known personality" to be seen. She is relieved to recognize "Max de Winter" (Laurence Olivier), a dashing Britisher of Manderley estate - and the man from the cliffside - and invites him as one of her "old friends" to have coffee with them. Although the elegant gentleman de Winter converses with the older woman, who absurdly strives to be accepted in the fashionable social circles of the Continent, he appears interested in speaking to the young woman but she is totally dominated and controlled by the matron. When he finds an opportunity, he asks what she thinks of Monte Carlo, to which she responds in a forward way: "Oh well, well I think it's rather artificial." De Winter reveals an air of mystery and independence by traveling alone and by his sudden departure prefaced with a motto: "I'm afraid I cling to the old motto: 'He travels fastest who travels alone.'" By the way, my dear, don't think that I mean to be unkind, but you were just a teeny, weeny bit forward with Mr. de Winter. Your effort to enter the conversation quite embarrassed me and I'm sure it did him. Men loathe that sort of thing. Oh come, don't sulk. After all, I am responsible for your behavior here. Perhaps he didn't notice it. Poor thing. I suppose he just can't get over his wife's death. They say he simply adored her. de Winter (solemnly): To me, it's just the place where I was born and I've lived in all my life. But now, I don't suppose I shall ever see it again. de Winter: Come, I'll take you home. Oh yes, I know Mr. de Winter well. I knew his wife too. Before she married him, she was the beautiful Rebecca Hindreth, you know. She was drowned, poor dear, when she was sailing near Manderley. He never talks about it, of course, but he's a broken man. That night during her restless sleep, the young woman hears over and over again Mrs. Van Hopper's words about Rebecca and the mourning de Winter: "She was the beautiful Rebecca Hindreth, you know...They say he simply adored her...I suppose he just can't get over his wife's death...But he's a broken man." During their courtship, the young woman is invited on more drives in de Winter's car. Mrs. Van Hopper can't understand why Maxim hasn't returned her own phone calls or answered her notes. The cranky woman sits in her sick bed, gorging herself on chocolates and extinguishing her cigarette in a jar of cold cream - revealing her vulgarity and petulance. Woman: You know, I, I wish there could be an invention that bottled up the memory like perfume and it never faded never got stale. Then whenever I wanted to, I could uncork the bottle and, and live the memory all over again. de Winter: And what particular moment in your young life would you want to keep? Woman: Oh, all of them. All these last few days. I-I feel as though I've, I've collected a whole shelf full of bottles. de Winter: Sometimes, you know, those little bottles contain demons. They have a way of popping out at you, just as you're trying most desperately to forget. (Feeling put down, the young woman starts biting her nails.) Stop biting your nails! Woman: Oh, I wish I were a woman of thirty-six, dressed in black satin with a string of pearls. de Winter: (Laughs) You wouldn't be here with me if you were. Woman: Would you please tell me, Mr. de Winter, why you ask me to come out with you? Oh, it's obvious that you want to be kind, but why do you choose me for your charity? de Winter: (He abruptly stops the car in the middle of the road.) I asked you to come out with me because I wanted your company. You've blotted out the past for me, more than all the bright lights of Monte Carlo. But if you think I just asked you out of kindness or charity, you can leave the car now and find your way home. Go on, open up the door and get out. (The young woman begins crying and he hands her a handkerchief.) Care to blow your nose? de Winter: Please don't call me Mr. de Winter. I've a very impressive array of first names, George Fortescu Maximilian, but you needn't bother with them all at once. My family called me Maxim. And another thing, please promise me never to wear black satin or pearls, or to be thirty-six years old. Their relationship is threatened when Mrs. Van Hopper exclaims that her daughter is engaged to be married and they must leave at once - on the 12:30 train for Cherbourg, ultimately bound for New York. Repeatedly, the young woman fails to contact Maxim before leaving for America. Finally, on the verge of their departure, she bids him a last goodbye in his room. Woman: I don't want to go. I shall hate it. I shall be miserable. de Winter: ...Which would you prefer? New York or Manderley? Woman: Oh, please don't joke about it. Mrs. Van Hopper's waiting, and I better say goodbye now. de Winter: I repeat what I said. Either you go to America with Mrs. Van Hopper or you come home to Manderley with me. Woman: You mean you want a secretary or something? de Winter: I'm asking you to marry me, you little fool.